On Wednesday, August 9, 2017, team "Clear Solutions," composed of young entrepreneurs from across the region, won first place in the 2nd annual JA Entrepreneurship Summit Pitch Competition. Team "Clear Solutions" was comprised of nine students from all across the DMV region, with a wide range of both ideas and strengths. 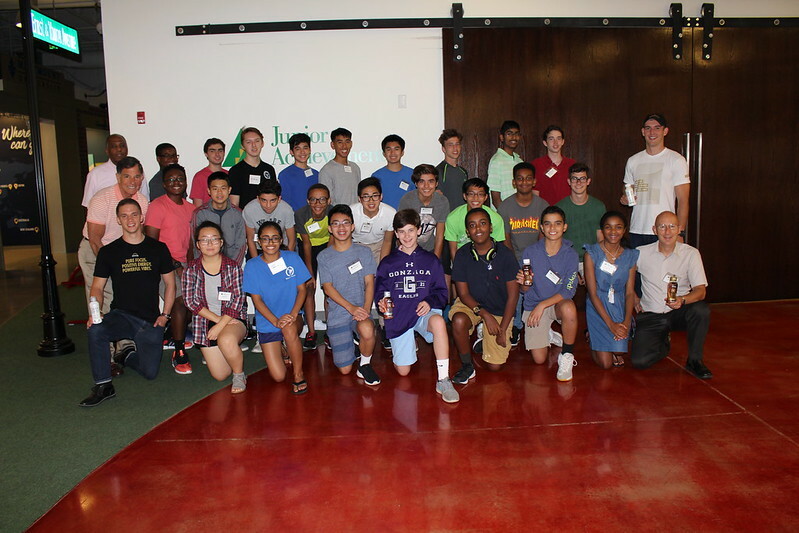 Led by volunteer mentor James "TaB" Patrick, the members of team "Clear Solutions" included Ethan Forester, Kendrick Groman, Josemari Roque, Bennett Scheer, Sarika Sindhwani, Don Tran, Kalvin Vannavong-Indasom, Paolo Vicencio, and Porter Wallington. This year's competition was held at the new Mason Innovation Exchange (the MIX) on the campus of George Mason University. This event was the culmination of the 2017 JA Entrepreneurship Summit, a five day, interactive experience where students are presented with a problem and work in teams to develop solutions that they ultimately pitch Shark Tank-style. The students were split into three teams and tasked with developing a corporate social responsibility (CSR) initiative or plan for SUNNIVA, the 2017 JA Entrepreneurship Summit business partner. SUNNIVA is a super coffee startup founded locally by brothers Jordan, Jake and Jimmy DeCicco whose goal is "to provide ambitious achievers with the healthy nourishment and motivation they need to create the future." Their message to students at the Summit was "You can be whoever you want, you just need to believe in yourself, commit to your dreams, and relentlessly work through every obstacle you face." Throughout the summit, students participated in mini-workshops helped them develop both their technical and soft skills. They thought through all aspects of their proposed solutions including finances, marketing strategy, production, and much more. With the support and guidance of local business volunteer consultants, students were pushed to really think out of the box and develop creative solutions. Team "Clear Solutions" ultimately impressed the judges with their eco-friendly CSR plan to incorporate perforations on SUNNIVA labels that would increase their ability to be recycled. Their solution incorporated a social media campaign to advertise the new eco-friendly bottles and promote SUNNIVA's organizational commitment to decreasing their environmental footprint. Other teams developed solutions ranging from a community 5k race to strategic partnerships with local gyms. Junior Achievement of Greater Washington congratulates all three teams for an outstanding job and thanks SUNNIVA for their commitment to helping us empower future entrepreneurs with the skills to succeed in the future.